German philosophy, here taken to mean either (1) philosophy in the German language or (2) philosophy by Germans, has been extremely diverse, and central to both the analytic and continental traditions in philosophy for centuries, from Leibniz through Kant, Hegel, Marx, Schopenhauer, Nietzsche, Weber, to contemporary philosophers such as Martin Heidegger and Ludwig Wittgenstein. Christian Wolff (1679–1754) was a German philosopher. He was the most eminent German philosopher between Leibniz and Kant. His main achievement was a complete oeuvre on almost every scholarly subject of his time, displayed and unfolded according to his demonstrative-deductive, mathematical method, which perhaps represents the peak of Enlightenment rationality in Germany. The three most prominent German Idealists were Fichte (1762–1814), Schelling (1775–1854) and Hegel (1770–1831). On some interpretations, Hegel did away with Kantianism altogether to achieve absolute knowledge, while others read him as working within the confines of Kantianism. 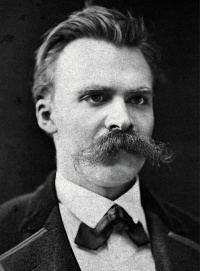 Either way, he came to replace Kant as the dominant influence in German Philosophy for the rest of the 19th century, and his method of dialectics has become a commonplace means of reasoning in continental philosophy. Originally hermeneutics referred to the interpretation of texts, especially religious texts. In the 19th century, Friedrich Schleiermacher (1768–1834), Wilhelm Dilthey (1833–1911) and others expanded the discipline of hermeneutics beyond mere exegesis and turned it into a general humanistic discipline. Schleiermacher wondered whether there could be a hermeneutics that was not a collection of pieces of ad hoc advice for the solution of specific problems with text interpretation but rather a "general hermeneutics," which dealt with "art of understanding" as such, which pertained to the structure and function of understanding wherever it occurs. Later in the 19th century, Dilthey began to see possibilities for continuing Schleiermacher's general hermeneutics project as a "general methodology of the humanities and social sciences". After World War II, a group of Marxists who broke radically from Marxist Orthodoxy formed the Frankfurt School, also profoundly influenced by Sigmund Freud's psychoanalysis and Weberian philosophy. Books from the group, like Adorno’s and Horkheimer’s Dialectic of Enlightenment and Adorno’s Negative Dialectics, critiqued what they saw as the failure of the Enlightenment project and the problems of modernity. They are generally considered to be the beginning of, or at least precursors to, postmodern thought in continental philosophy. Unless indicated otherwise, the text in this article is either based on Wikipedia article "German philosophy" or another language Wikipedia page thereof used under the terms of the GNU Free Documentation License; or on original research by Jahsonic and friends. See Art and Popular Culture's copyright notice.